Sen. Cory Booker’s name comes up frequently in talk about the 2020 presidential race, but some Democrats wonder if he has what it takes to compete in what could be a crowded primary. 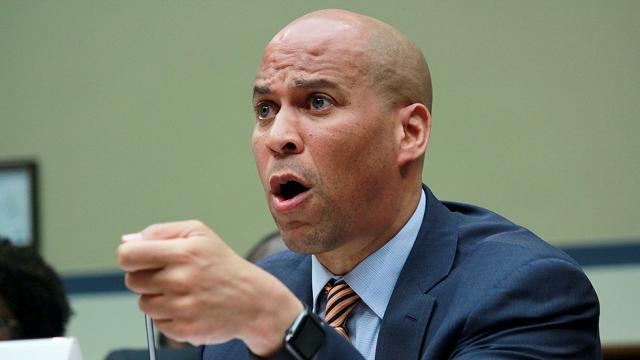 While Democrats say Booker, 48, is one of the party’s “fresh faces” compared to elder statesmen like former Vice President Joe Biden and Sen. Bernie Sanders, they aren’t sure he has created a lane for himself against would-be rivals. “It’s a very high ceiling but he hasn’t met early expectations,” said one top Democratic strategist who has worked on several presidential campaigns. “He needs a signature fight or issue to really differentiate himself. Booker — who is known for his nonstop Twitter presence and his touchy-feely speeches — hasn’t quite captured the attention of party insiders and big donors, many Democrats say. And there’s a fear he may be a little too soft for the party’s white-knuckled approach against President Trump. Booker’s office did not respond to a request for comment on this story. But in an interview earlier this year on “The Ezra Klein Show,” Booker acknowledged that Democrats want him to be a little tougher. “I think again we lose a bit of our moral compass when we are demonizing people. I just don't believe you need to be mean, you need to be deceitful, you need to proactive the dark arts in order to win elected office,” he said. Booker is seen in different lights by centrists and progressives in the party. The increasingly energized progressive wing of the party sees him as too pro-business. Booker has long-running ties to Wall Street. In the 2013-2014 election cycle, he filled his coffers, raising nearly $2 million from the investment and securities industry — bringing in more from the industry than any other candidate. Centrists believe he’s trying to reinvent himself as a progressive. This summer he announced that he was backing Bernie Sanders’s single payer healthcare proposal. He also began advocating for the legalization of marijuana and introduced an environmental justice bill. The effort as clearly aimed at increasing Booker’s appeal with progressives. Advocating for the legalization of marijuana in particular “signaled a desire for an eventual candidate Booker to have a case to make to millennials,” said Brigid Callahan Harrison, a professor of political science and law at Montclair State University. But some Democrats think the move to the left isn’t a good one for Booker, given rivals who will be clear favorites with that part of the party. The top Democratic strategist agreed that it may be tough for Booker to win over progressives in a race against the likes of Warren and Sanders. Booker remains an attractive candidate who is relatively well known. A poll out last month from the University of New Hampshire showed that Booker trailed just Biden, Sanders and Sen. Warren (D-Mass.) in a survey among Democratic voters. Last year, for example, then-presidential candidate Donald Trump took to Twitter to attack Booker. Booker has “walked the walk in a way few politicians have done,” he added. He got some props from Democrats in January when he testified against Jeff Sessions — a move that made him the first sitting senator to testify against a fellow senator’s cabinet nomination. The junior senator may have also gotten a light endorsement of sorts from Donna Brazile, the former interim chief of the Democratic National Committee, who wrote in a new book that she had briefly considered replacing Hillary Clinton and running mate Tim Kaine with a Biden and Booker ticket. “I think it played well in the sense that he didn't see it coming and what it continues to do is to portray him as the future of the Democratic Party,” Murray said. Harrison said his soaring speeches and more gentle and bipartisan approach might also work to his advantage. “In this political climate, boy isn’t that something that is really appealing right now?” she said. 0 Response to "latest us news: Booker tries to find the right lane"